home is where they send us...: A great way to teach the kids about Columbus Day! A great way to teach the kids about Columbus Day! On our weekly library trip last week I picked up a few books about Christopher Columbus! I had originally planned on reading them next week in prep for Columbus Day (October 14) but the kids had other plans. They, like always, wanted to read them the very second we got home! The favorite book of the bunch was a Scholastic Book, My First Biography: Christopher Columbus. It has colorful photos to keep the child's attention and tells the story of Christopher Columbus in simple terms. It is definitely an easy reader book! 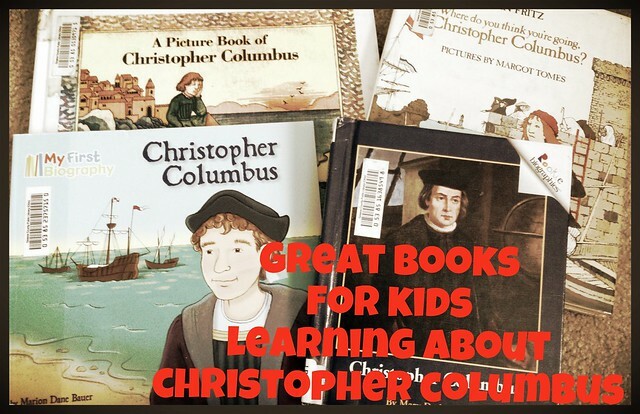 The next books the kids enjoyed were Christopher Columbus (Rookie Biographies) and A Picture Book of Christopher Columbus. These books were both child friendly. The illustrations are not as nice as the first book, though! The rookie biography was something you could give a child to read and learn by themselves, where as, the picture book was more of a story. Both books did tell the story of Columbus just differently. Lastly, I also picked up the book Where do you think you're going, Christopher Columbus? This book has seventy-five pages and is a great read for older kids (think grade 2-8). Each page has a lot of words with just a few small pictures. The younger kids had a harder time sitting for this book but Gator and I did finish reading it together. Any, or all, of these books should be available at your local library for free! They would all make great resources for to teach your children about Christopher Columbus and the discovery of the Americas! While I was at the library I did also pick up a couple documentaries to watch about Columbus but they seemed to be well beyond Gator's years. In fact, she tried to convince me she was enjoying it but she fell asleep! If you are still looking for some fun ways to learn about Columbus - consider doing this FREE lapbook with us. And, jump on over to Brain Pop, Jr. for some more fun ideas! EDIT to ADD: I just saw this blog with free printables! Looks like a lot of fun for the younger kids! Awesome post and I love your button you made- adorable!